It is now my fifth year with my Greenwich family, and I couldn’t be more thrilled. This is the longest endorsement I’ve had with a brand, and I am just so grateful to be part of the barkada after all these years. I still remember the first commercial I did with Anne in 2009. We were asked to ad-lib one scene and I remember getting so nervous about it, I was shaking. It wasn’t the first time for me to do a commercial, but it was the first commercial I did that didn’t stick to the storyboard. It frightened me that we were given a free hand to do what we wanted and be ourselves. Coming from a modeling background where I just did what I was told, this proved to be difficult for me. But then I got into showbiz in 2010 and immersed myself into the industry for about a year. In this time I learned so much about myself and how to use my “tools” (my body and my voice) to act out a scenario. It was only after this time that I let go of my shyness and inhibitions and began enjoying all the freedom we were given during our commercials. It was also this year that I did the craziest Greenwich commercial to date, and it was a solo board! I had to sing and dance in this TVC, but since I had to be terrible at both, I found it to be very fun. 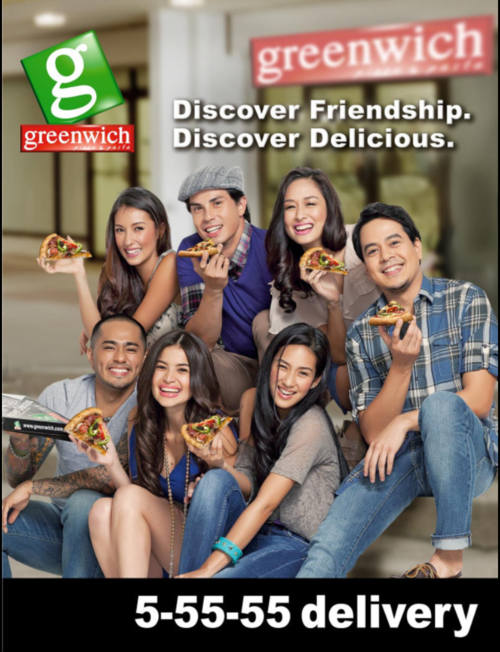 And then came the year when the pasta girls (Anne, Solenn and I) met the pizza barkada (John Lloyd, Lloyd, Mikaela and Joe Vince). This was super fun to do, because we all just had to be silly in our own way. The story lines of the three commercials were light and funny. Very Greenwich. Last year, the pasta girls came out with a TVC that gave more. And we really pulled on all the stops for this one. We had super slow-motion effects, trampoline jumps—the works. Award-winning director Yam Laranas even came on board to direct the commercial for us. For this year’s commercial, well, I can’t really give anything away, but its a definite must-see. We shot the TVC and print advertisement a few weeks ago and as usual, it was so much fun making kwentuhan with the girls on set. I keep saying it again and again: it really doesn’t feel like work when we’re doing a shoot for Greenwich! So before the new commercial and print launches I wanted to revisit the Greenwich shoots I’ve done over the span of five years. There are really so many great memories! I am so lucky to be part of this family!